Last year on our blog, we covered many of North Carolina's historical extreme weather events, including the state record snowfall -- 36 inches in 24 hours -- from Mount Mitchell during the so-called "Storm of the Century" in March of 1993. Given the well-timed convergence of potent ingredients in that event, it's no surprise that it has stood largely unchallenged as the state record for more than two decades. However, last January, a surprising snowfall report of 41 inches in 24 hours from Mount Mitchell seemed to set a new high (frozen) water mark for the state. So was the new total a contender or a pretender? To investigate things further, the State Climate Extremes Committee convened online this spring to hear evidence in favor of and against a new record, and each person on the five-member committee got to vote on whether the new total should stand as the state record. That committee included representatives from our office, the Southeast Regional Climate Center, the National Weather Service office in Greer, SC, the National Weather Service's Eastern Region headquarters, and the National Centers for Environmental Information. In this rare behind-the-scenes look at a record event review, we will share the same evidence and arguments that the committee heard, as well as the decisions that they reached. 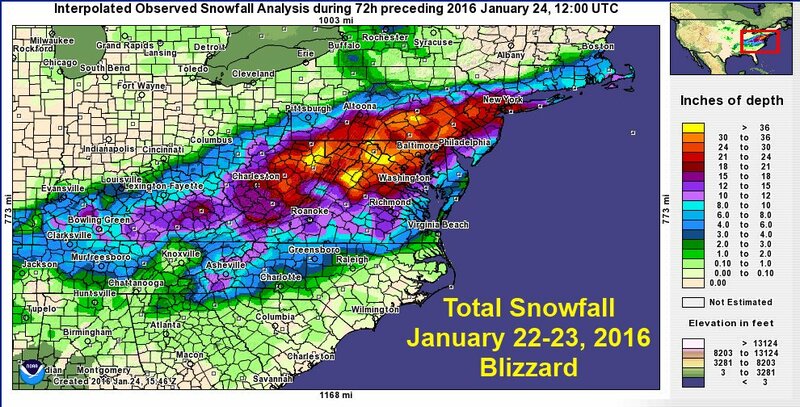 The winter storm on January 22-24, 2016, was in many ways a classic North Carolina event, with a combination of snow, sleet, freezing rain, and rain across the state. The greatest liquid precipitation totals came along the southern coast, but precipitation fell there as only rain. The map of preliminary snow totals from the National Weather Service in Raleigh included an extreme 57-inch accumulation from Mount Mitchell. Farther north and west, more than a half-inch of ice resulted in widespread power outages in Harnett, Johnston, and Wake counties. Those areas saw limited snowfall, but totals were higher along the Virginia border and in the Triad and Foothills. In the Mountains, precipitation fell as all snow, and multiple sites reported totals of 12 inches or more. But one station stood above the rest, both in terms of its elevation and its snow reports. Observers at the National Weather Service's Cooperative Observer station on Mount Mitchell -- at 6,240 feet above sea level, the highest-altitude station in North Carolina -- reported 41 inches of snow in the 24-hour period ending at 7 am on January 23. Combined with additional snow from the surrounding days, the station reported a peak snow depth of 63 inches. However, before becoming a cause for celebration, that extreme total called for a closer investigation. Simply put, when it comes to extreme weather reports, it's often tough to argue with hard numbers. Much like the legal philosophy of "innocent until proven guilty", weather reports from trusted observers at an official station are generally considered credible. That certainly applies to the brave state park staff who ride out the harsh winters atop Mount Mitchell. Furthermore, Mount Mitchell is a common ground for uncommon and extreme weather. In addition to holding the existing record for the greatest 24-hour snowfall, it is also the record-holder for the lowest statewide temperature -- -34°F on January 21, 1985 -- and the coldest site in North Carolina based on the annual average temperature. In January's event, air rising up the mountain slopes led to heavy snow, so as the highest point east of the Mississippi River, it made sense that Mount Mitchell would have one of the greater snow amounts. In addition to those elevation effects, localized or microscale meteorological phenomena such as snow banding can cause even heavier snowfall during wintry events. While a new state record snow total initially seemed incredible, it also didn't seem completely unreasonable given these possibilities. Shortly after the event, the National Weather Service in Greer, SC, whose forecast area includes Mount Mitchell, began to compile evidence beyond just the reported snow totals. In particular, they collected photos taken by staff at the Mount Mitchell State Park during the event. One of those photos showed snow piled just above the top of a guardrail that stands 30 to 34 inches high. This provided a useful comparison, but still couldn't confirm or deny a possible record. Trees behind the railing could have acted as a shield from the snow, while winds blowing toward the rail could have helped it mount up a bit higher at that spot. Additional photos and reports indicated that variable snow depths like those around the guardrail were common on the mountain. Observations from our ECONet weather station showed sustained winds of up to 35 mph, which could have certainly caused drifting or blowing snow. The simple presence of such drifts, combined with the difficulty of taking measurements in blizzard-like conditions, made the official reports seem a bit less exact. Along with photos, a useful verification tool can be comparing snow amounts with the liquid precipitation totals. Even that proved tricky during this event since the rain gauge at the Mount Mitchell station was buried beneath the snow. At other mountain sites, the highest reported liquid precipitation total on January 23 was 1.55 inches in Fletcher, while other nearby stations reported about an inch of liquid. 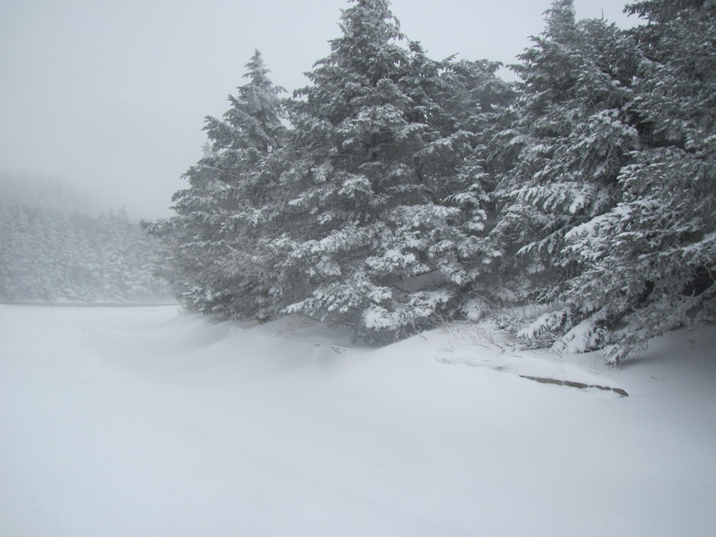 Even if 1.5 inches of liquid fell at Mount Mitchell, when compared with the 41-inch snow total, that gives a snow-to-liquid ratio of more than 26-to-1. Other mountain sites had ratios of just 9-to-1 or 10-to-1 during this event, and while higher ratios aren't uncommon, they typically only happen when the air is extremely cold. 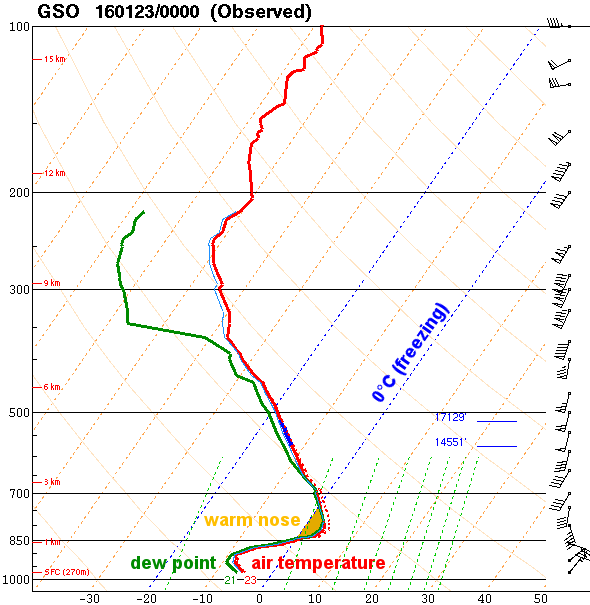 During this event, upper-air temperature profiles showed a nose of warmer air present -- the same feature that eventually caused the snow to change to sleet and freezing rain farther to the east. That made such a high ratio extremely unlikely and provided more cause for concern about the legitimacy this potential record. Such high totals, it seemed, simply weren't meteorologically possible during this event. 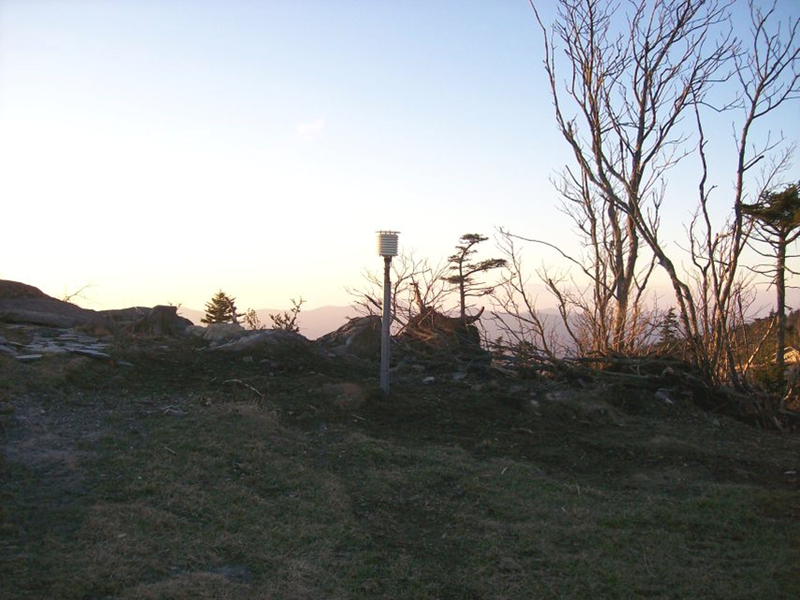 Just like in a courtroom, the evidence on both sides was presented and testimony was heard from experts familiar with Mount Mitchell, the weather station, and the local meteorological characteristics. Finally, a vote was held, and in a unanimous decision, the five voting members of the State Climate Extremes Committee decided not to accept the 41-inch snow report as North Carolina's new record. However, it wasn't sufficient to leave it at that. If there wasn't 41 inches of snow on January 23, then how much did fall? And what should the records show for this entire event? To determine that, those snow-to-liquid ratios again became important. Using an estimated liquid precipitation total of 1.56 inches with a ratio of 13-to-1 -- perhaps a bit generous considering the 10-to-1 ratios at other nearby sites -- the 24-hour snow total ending at 7 am on January 23 was adjusted to 21 inches, with a maximum snow depth of 36 inches the following morning. Those new numbers put Mount Mitchell's totals in much better agreement with what areas to the north reported during the storm. Baltimore, for instance, received 29.2 inches of snow and 2.13 inches of liquid precipitation for a snow-to-liquid ratio of 13.7-to-1. Although this event review lacked the dramatic conclusion of a new statewide record, it showed once again that the review system in place works well to provide a judicious and scientific look at these extreme events. For anyone worried that Mount Mitchell was shafted, just remember that it does still hold the statewide snow record plus a few others. And its revised totals of 21 inches in one day and 36 inches for the event are several times more snow than most other sites in the state typically see in an entire winter. So it was still an incredible, impactful snow event, but just not a record-setter. Thanks to John Tomko and Christopher Horne at the National Weather Service in Greer, SC, for providing the photos and information for this post.